It’s hard to believe we are closing in on the first three weeks of school! Time really does fly when you’re having fun. 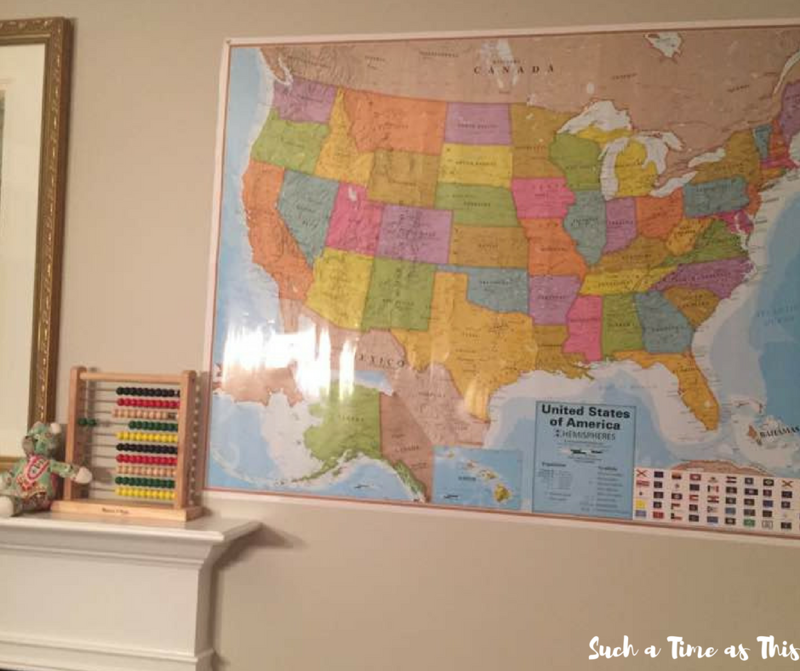 I wanted to update you guys on where we decided to put the homeschool room and how our first week of school went. So, this year we have an 8th grader, 6th grader, 4th grader, brand new kindergartener, preschooler, toddler and a new baby on the way! Whooh! 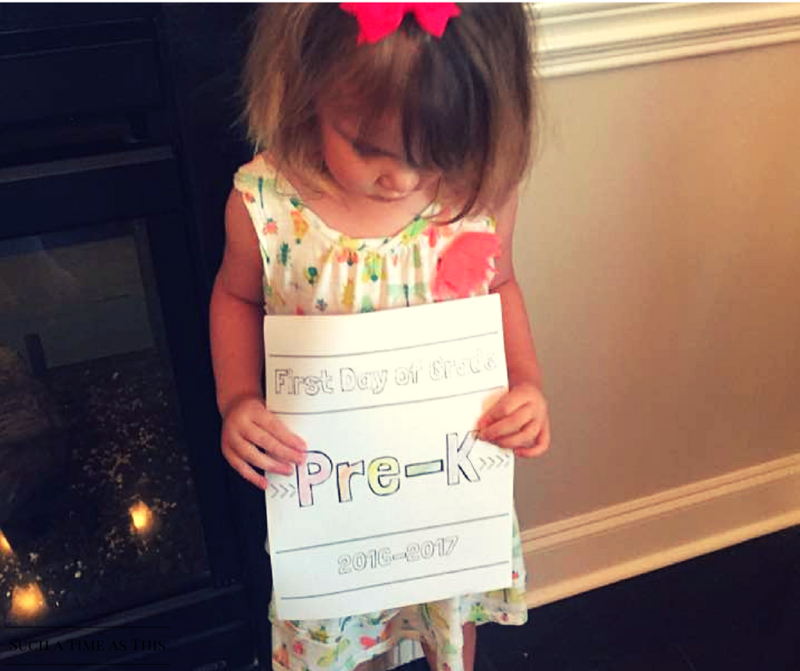 Our oldest started school in an autism special needs classroom at a local school. It was a hard decision, but we are hoping it helps him as he grows and matures. Our other five our at home with me. We do a once a week co-op which we’ve been a part of for several years now. 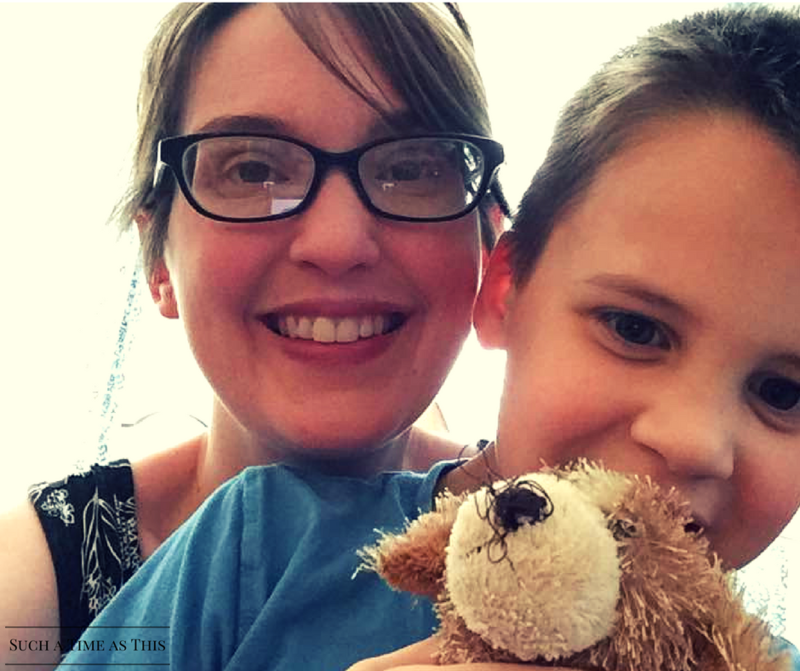 We love it – it provides a great outlet for making friends (for the kids and myself) and for doing science experiements (my 6th grader is taking A & P this year!). The rest of the week we have set up a great schedule that works for us. In the morning my older kids do some independent work both on the computer or in their binders/workbooks. I really enjoy the afternoons when we get to read together and study other subjects more in depth. 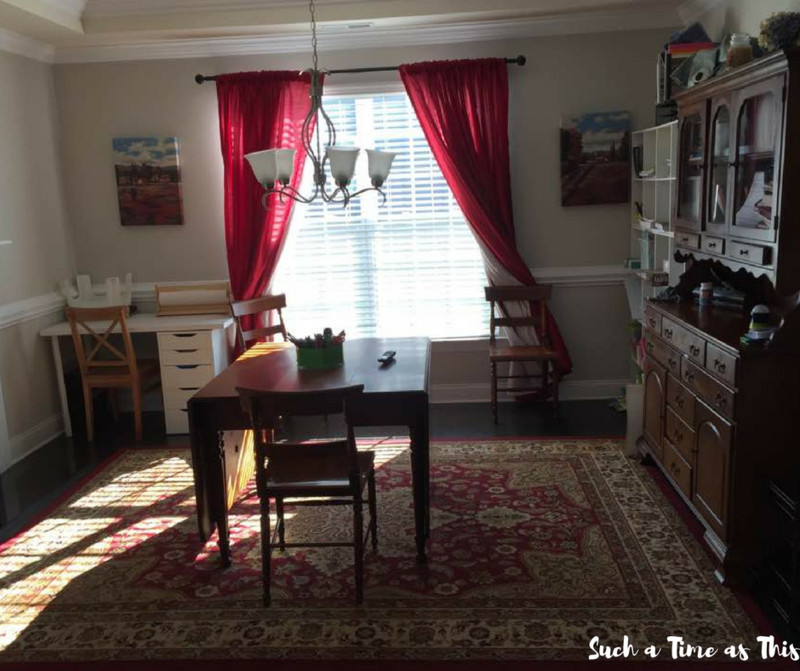 This Summer we were trying to decide if we wanted to create a new homeschool room space upstairs. 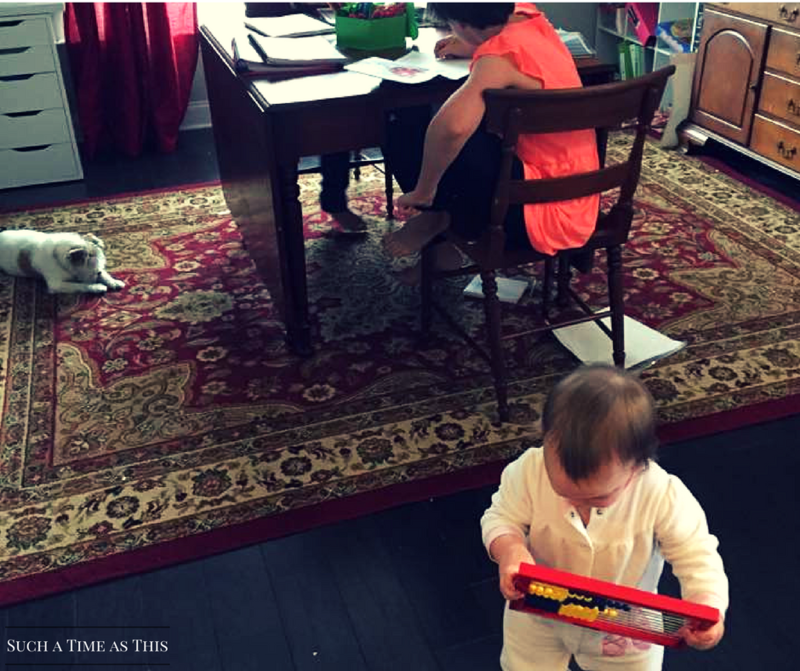 I really like to keep the kids all with me, downstairs, as I try to go about my day also cleaning, cooking, and doing laundry. 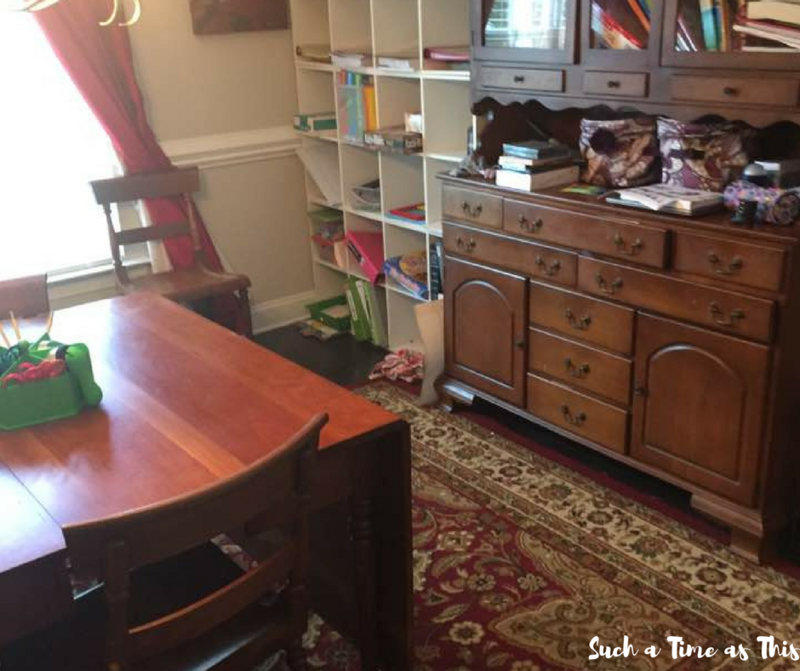 We decided, a few weeks before school began, to leave the homeschooling “stuff” in the dining room but to make it even more functional than it was last year. We don’t typically use the dining room to eat because we have such a big table in the kitchen. Though we have a full-size table in the dining room, I decided to drop the leaves of the table down so that it truly only fits two people, now. In a moments notice, I can pull one or both sides up so that more can sit there. We keep extra chairs off to the side in the same room. We don’t typically use the dining room to eat because we have such a big table in the kitchen. Though we have a full-size table in the dining room, I decided to drop the leaves of the table down so that it truly only fits two people, now. In a moments notice, I can pull one or both sides up so that more can sit there. We keep extra chairs off to the side in the same room. The toddler discovered our abacuses and went crazy pushing the beads around. We also added a little desk with a laptop to create another workstation over the in corner. 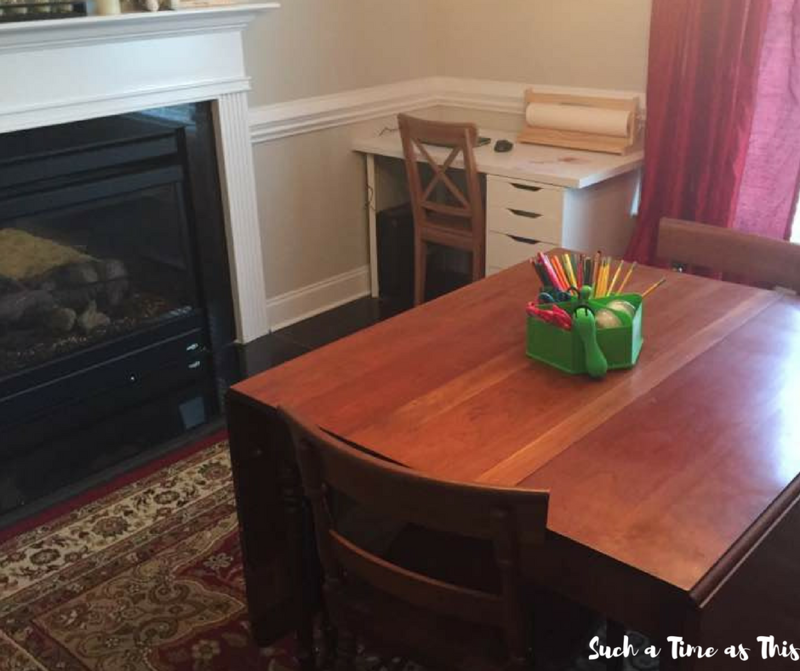 We are using technology for even more subjects this year, so I wanted a workspace to house a computer in the homeschool room. We decided to hang maps on each side of the fireplace. These are maps I found a few months ago at Costco. 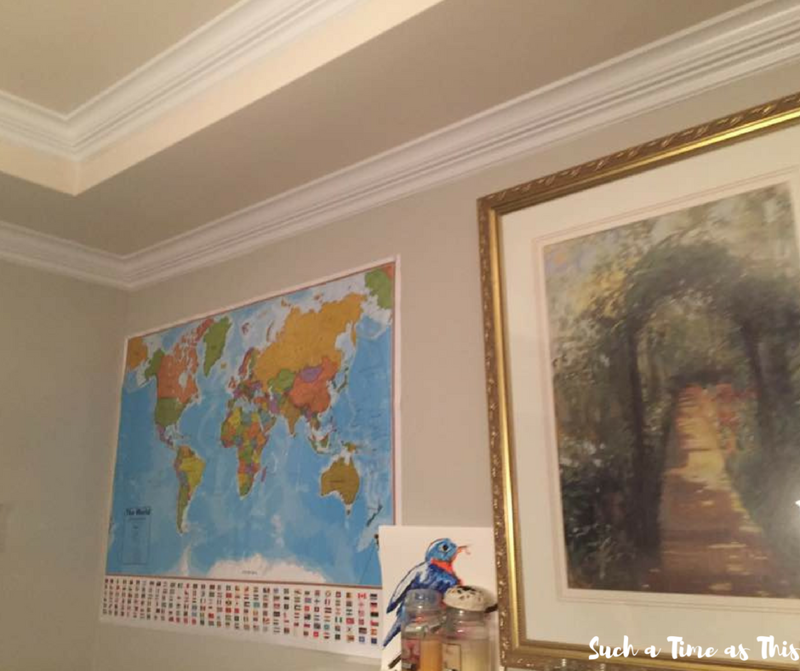 They were easy to hang and they have come in handy for our North American Geography (for the older elementary kids) and for our little Kindergartener to get familiar with our country and the world. Finally, we added all of our cubicles onto the wall to house the books, workbooks, notebooks and extra supplies. The china cabinet also houses books and supplies along with the caddy on the table. I like how the room turned out. It is functional and practical. You can’t see it in this picture, but our piano is on the other side of this picture (the angle that the camera is in). This allows our 11 year old to practice playing as soon as he is done with school (he gets done after his younger siblings). Mr. D. is just loving his kindergarten studies. More on this in a separate post. 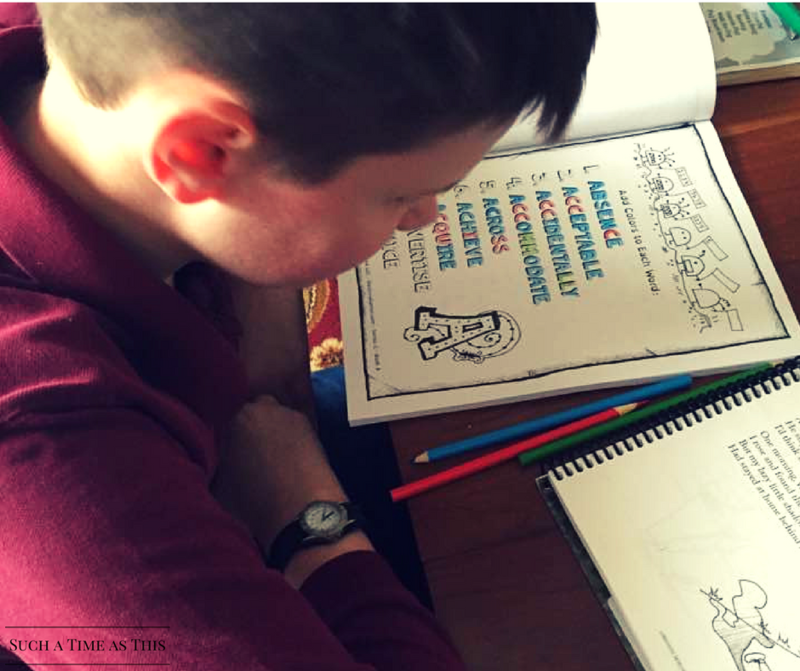 Our 6th grader has been enjoying his new spelling book Spelling Time (Master the Top 150 Misspelled Words). I like that he gets to color in the letters to the words however he wants. I’m hoping that by coloring in the letters that he doesn’t think belong, he will actually learn the correct spelling! So far, I’ve been enjoying our relaxed Fridays which include a nature walk or visit to the park, library time, nature sketches, a drawing/painting/or pottery making time, studying a famous artist and pretty soon we will add in a hymn study and composer to the lineup. I’m also happy that sketching and piano time are part of our kids’ regular curriculum line up. I think it is important to make room for the arts! I’ve also liked how well the clip board charts have worked out for us! They have been a blessing as we strive to produce a little bit more independence in our middle school and older elementary age kids. Feel free to download your own here. 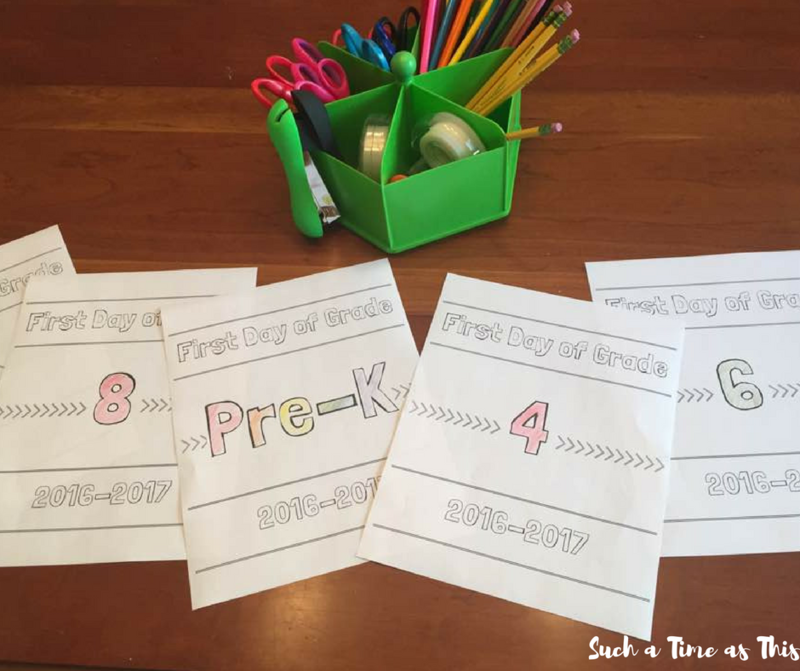 While the older kids are doing their school work on their own, my kindergartener and I work on his school. We also play with the pre-schooler and toddler during this time. After lunch, we do naptime for the littles and I read history and science to the older ones. We also work on co-op homework and play board games if time allows. How are your first weeks going?